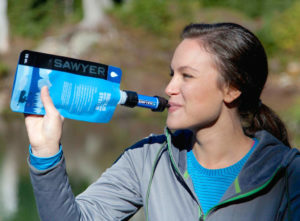 Home Breaking News Group Bringing Sawyer Water Systems to V.I. Group Bringing Sawyer Water Systems to V.I. Sawyer Products makes a wide variety of water filtration systems, including the two-gallon system being brought into the territory. Following Hurricanes Irma and Maria, Virgin Islanders readily snatched up cases of drinking water in individual plastic bottles and cartons. It’s natural that residents would want to drink safe, clean water, but with our landfills at capacity, the empty water containers have added to the growing crisis of what to do with our trash. Meanwhile, environmentalists continue to warn us of the dangers of adding more plastic to the nine billion tons already on earth. What’s a thirsty person to do? However, some residents are reluctant to give up their bottled water. Health authorities have advised them not to drink tap or cistern water without treating it, but proper treatment can be problematic. Some are confused about the right amount of bleach to add; others don’t have working stoves on which to boil water. Thanks to a coalition of church and community groups, kits using a simple system to convert non-potable water to safe, clean drinking water are now available in the Virgin Islands, according to Van Rensselaer. It’s known as the Sawyer water filter system, and all one has to do is pour two gallons of untreated water into the kit’s plastic bag, then wait four minutes while the water trickles down a tube through the Sawyer filter and into a clean container. A two-gallon kit can provide water for 35 people a day. The Rotary Club of St. Thomas East and the Nazareth by the Sea Episcopal Church have already brought several hundred kits to the islands and are working to bring in 3,000 more. A single Sawyer water filter can provide a million gallons of drinking water, Van Rensselaer said. Originally developed for use by soldiers in Vietnam, “The filters use Nano-tubes, the same technology used by dialysis patients to clean their blood,” she said. Rotary East and Nazareth by the Sea have been working in partnership with the International Humanitarian Foundation, the Rotary Club of Ridgeway, New Jersey, and Reform Church pastor Andy Topp to give the kits away for free. They’ve distributed Sawyer systems on St. Thomas, St. John, St. Croix, Tortola, and Virgin Gorda. They hope to expand distribution to St. Martin, Dominica, and other islands that are part of their Rotary Club district. The technology has been widely used in Haiti. “We left 40 with the Coral Bay Community Council, and they called back later that day to say they would like 50 more,” said Van Rensselaer. Topp has provided matching funds for the 600 filters being distributed, and he’s hoping to buy up the entire stock of 3,000 filters that are in production now. People can acquire a filter or donate to the cause by contacting the Rotary Club of St. Thomas East at 9160 Estate Thomas, PMB 306, St. Thomas, VI 00802. Some tax benefits may accrue to the donation. Nazareth by the Sea Episcopal Church is at 6501 Red Hook Plaza, Suite 201, St. Thomas, VI 00802.